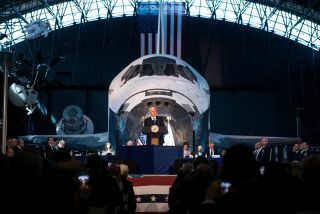 WASHINGTON – When members of the National Space Council meet this week, they are expected to discuss, among other issues, regulatory reforms intended to promote growth of the commercial spaceflight industry. The Council will hold its next formal meeting Feb. 21 at NASA’s Kennedy Space Center, a meeting formally announced by NASA and the White House less than 48 hours in advance, although plans for the meeting had been circulating in industry for weeks. The meeting will be the second formal gathering of the Council since it was reconstituted by an executive order in June 2017, after an Oct. 5 meeting near Washington. One topic expected to be on the agenda, though, is regulatory reform. "One of the things we’re going to be doing is hearing about thoughts and progress on regulatory reform proposals," said Scott Pace, executive secretary of the Council, during an onstage interview at the Federal Aviation Administration's annual Commercial Space Transportation Conference Feb. 7 here. "We're not going to solve everything at once, but we're going to try to make measurable progress on the regulatory environment," he said. That effort, he added, was intended to not only lower costs for companies, but also attract companies in other countries to the United States. At the previous Council meeting in October, Vice President Mike Pence, chairman of the Council, directed the Secretaries of Commerce and Transportation, as well as the Office of Management and Budget, to carry out a “full review of our regulatory framework for commercial space” to identify potential reforms, and provide a report in 45 days. The head of the FAA's Office of Commercial Space Transportation (AST) embraced that effort. "The great thing for us about tackling that assignment is that we are totally on board: no arm-twisting required," George Nield, FAA associate administrator for commercial space transportation, said at the conference Feb. 7. "Regulatory streamlining is something that is good for industry and good for the government." "We look forward to working with the Council, and with industry, to implement a number of those streamlining ideas," he said. He didn't give a timetable, though, regarding when those changes might be implemented. Some of those efforts may take some time. "Our goal for regulatory reform is to update, consolidate and streamline all launch and reentry regulations into a single performance-based regulation," said Randy Repcheck, deputy manager of AST's regulations and analysis division, during a Feb. 8 panel discussion at the conference. That regulation, he said, would need to be tied to a body of industry standards still being developed. "That’s our goal. It's going to take three to five years, maybe sooner, but we’re going to do it as fast as we can." Regulatory reform could also address another issue: limited resources at AST. The office has long complained that limited funding for the office, which received less than $20 million in fiscal year 2017, could delay licensing and oversight of the commercial launch industry by keeping it from hiring sufficient staff to deal with the growing number of launch and spaceport license applications, and other issues in its purview. House and Senate versions of fiscal year 2018 appropriations bills, yet to be finalized by Congress, both offer $21.6 million for AST. The administration's new budget request, released Feb. 12, proposed the same amount for the office in fiscal year 2019. Further increases may not be forthcoming. "It’s clear that, as the rate of launches increases, the FAA needs to do a better job of keeping pace," said Rep. Bill Shuster (R-Pa.), chairman of the House Transportation Committee, in a conference address Feb. 7. "Doubling the number of launches cannot mean a doubling of budgetary resources. We just don’t have the resources, so we have to do a better job." Shuster welcomed the Council’s reform efforts. "We look forward to the regulatory reform recommendations under development by the National Space Council, in collaboration with the regulatory agencies," he said. "We stand ready to consider any legislative proposals to streamline these processes." Daniel Elwell, the acting administrator of the FAA, spoke at the conference immediately after Shuster and backed reform, provided the efforts did not jeopardize safety. "Let's get to it: we need to license launches faster," he said. "But industry has got to improve its safety performance, just like the airlines. I expect more from FAA and government, but I also expect more from industry." Regulatory reform discussions, though, go beyond commercial launch licensing. "Secretary [Wilbur] Ross, I can tell you, has a keen personal interest in space and space commerce," said Jason Kim of the Office of Space Commerce during a Feb. 8 panel discussion. "His main mission in life right now is regulatory reform, writ large.” That includes, he said, space regulatory reform, which for the department includes issues such as export control and commercial remote sensing regulation. The department, Kim said, had come up with ideas for both short- and long-term regulatory reform as it applied to areas under its oversight, although he did not elaborate on those proposals. Reform ideas in general, he said, included eliminating or modifying regulations and streamlining processes to speed up regulatory processes and providing more transparency. He added the department also looked at reducing uncertainty, such as how so-called “non-traditional” space activities would be regulated. Kim said that, as of the that panel discussion, the department was still waiting to hear back from the Council on the proposals it submitted for its 45-day report. "I think that's going to be one of the agenda items for the next meeting of the National Space Council," he said.